Hello Unregistered ! Welcome to Leathernecks Member's Gallery. Please enjoy your stay. The rifle range at Camp Mathews. The tents at the right are where the troops stayed while at the range. 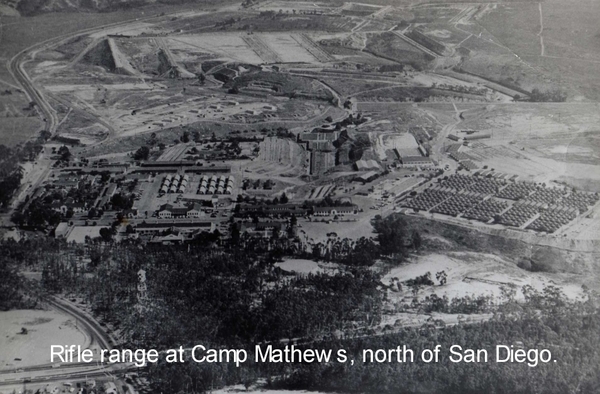 that picture of camp mathews,sure brimgs back memories. I was there in dec,1959.that is one xmas i will never forget. I was there in late Dec. 1963. I can remember driving down Interstate 5 (?) several years later and seeing the "pits" behind the old ranges next to the highway. Because it was so long ago, I was wondering exactly where Camp Mathews was located. Was it close to Torrey Pines? La Jolla right in the middle of where University of California, San Diego is now. I-5 runs through the middle of it from north to south. The total area of the base was then 573.75 acres, less than a square mile. It was only ten miles north of MCRD as the crow flies.